The caravan of Central Americans en route to the United States, hoping to request asylum, has called attention to weaknesses in U.S. border policy as it pertains to asylum seekers. Additionally, questions have been raised concerning Mexico's response (or lack thereof) to Central Americans seeking international protection. 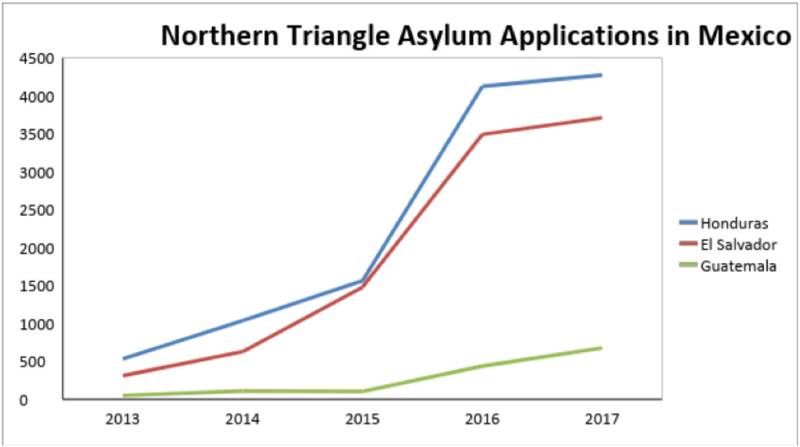 The figures below, from a report by the Mexican Ministry of the Interior, show that Mexico has experienced a continued increase in asylum applications over the last couple of years, especially from Central America's "Northern Triangle" countries (Guatemala, Honduras, and El Salvador). 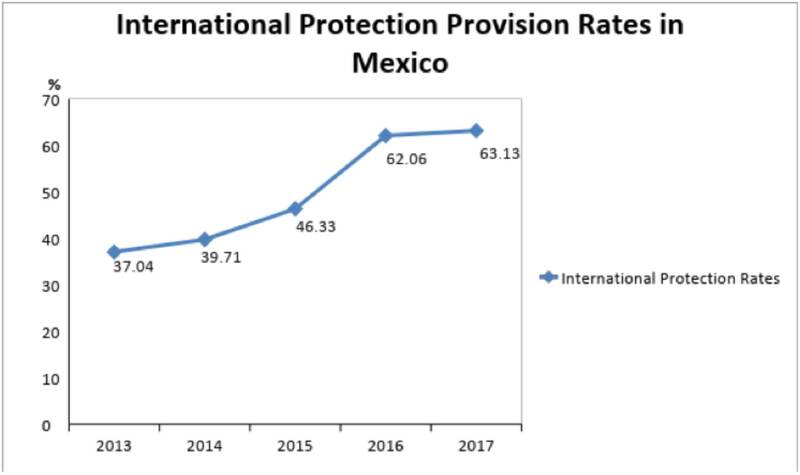 As application numbers increase, Mexico has also granted international protection (asylum and complementary protection as defined in Article 13 and Article 28 of Mexico's Law on Refugees, Complementary Protection, and Political Asylum) at an increasing rate, to individuals who complete the application process. It should be noted that many abandon the application process, and are not included in the data shown below. Recently, a UN Refugee Agency (UNHCR) representative in Mexico, Mark Manly, told Mexican news outlet El Universal that the increase in asylum applications in Mexico can be expected to continue. Manly attributes this trend to the persisting push factors in sending countries, the work of the Mexican government (in collaboration with civil society and UNHCR) to consolidate Mexico as a country of asylum, and the tightening of U.S. immigration enforcement. Arguably, the latter is the most significant contributing factor. Without an outlet at the U.S. border, migrants will be more inclined to make their asylum claims in Mexico. 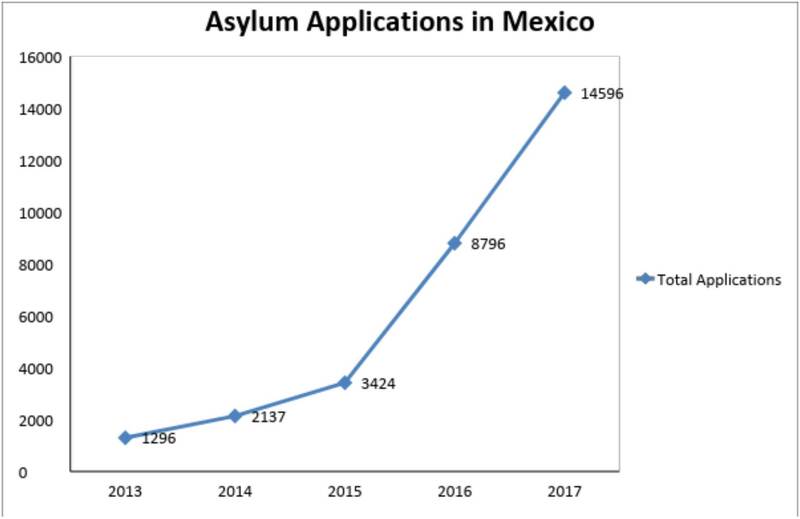 The UNHCR representative added, "Despite the significant increase in the number of asylum applications, for a country like Mexico, they are still easily manageable figures, taking into account the size of the population, the economy, and the administrative capacity it has." According to a joint press release by Mexico's Ministry of Foreign Affairs and Ministry of Interior, international protection will be granted to members of the caravan when appropriate. So, if Mexico has the capacity to deal with an increasing number of asylum seekers as suggested by the UNHCR representative, why would the Mexican government not provide international protection? The ease with which the Central Americans have moved across Mexico up to this point is only possible because the Mexican authorities know that their final destination is the United States. Similarly, the Central American migrants are not incentivized to make their asylum claims in Mexico because they know they can make it to the U.S.-Mexico border and make their bid for asylum in the United States instead. Ultimately, Mexico’s claim that it will enforce its immigration laws (by providing asylum/complementary protection, carrying out deportations, or quite likely giving free-transit permits) is merely reactive. If the caravan had not garnered so much attention, the Mexican government would have remained silent on the issue and continued business as usual. Consequently, it is imperative for the United States to take concrete action to stop the arrival of the caravan and thus deter future caravans.